are of the women who suffered abuse at the hands of their relatives. Originally jotted down by Dr. Harshinder Kaur in Punjabi they were later edited and rewritten in English by me. The bilingual book was designed and published beautifully by the Singh Brothers, Amritsar. 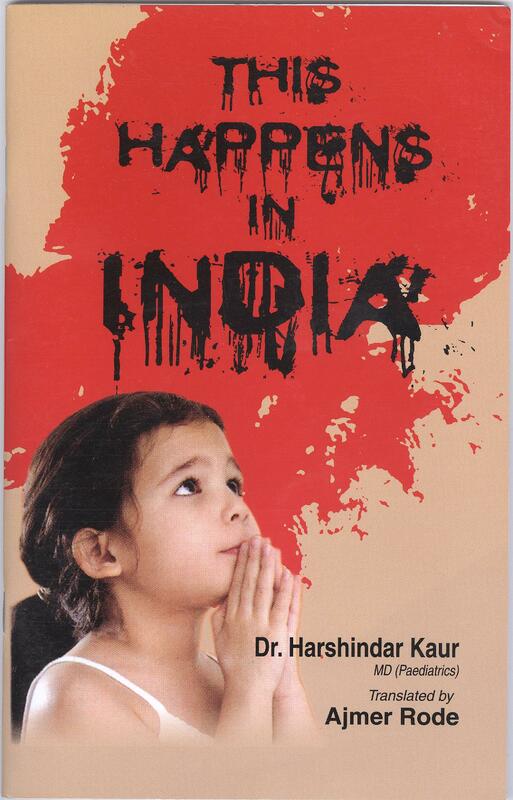 Women of Punjab share their pains with Dr. Harshinder Kaur. They phone, they write, they visit her in person. Harshinder also goes to visit them. There could be some villages where Harshinder may not have gone but there’re many where she and her husband Dr. Gurpal Singh have gone more than once. Women who die before she reaches them leave their tears for Harshinder. Stories in this book are written in these tears. Last time we (Navtej Bharati, Gurdev Chauhan and I) went for lunch at her house in Patiala. She and Gurpal inundated us with the sufferings of Punjabi women. We suggested she write these stories. But time? The room downstairs was full of women before we left. These stories are the stories of the womb of Punjab. Punjabis stab the womb from which they take birth. They feel ashamed before the world but continue stabbing the womb even deeper. What would you do with such people? They go blind when they thrust the knife. Maybe these stories will show them the blood of their daughters and sisters still dripping from their knives. ਮੇਰੀ ਸੁਣਵਾਈ ਕਿਉਂ ਨਹੀਂ ਹੋ ਰਹੀ? I am Luxmi Datlani, a woman of 95 years. living in Amboli’s Merry Blessing Society in Mumbai. I lie in veranda all day long. and throws an old sheet over me. At times they give me water and something to eat. when she returns home in the evening. leaving me in the veranda, forever. She was my youngest daughter. I have six more. and want to get rid of me. has made ‘great’ laws for elders. I cry out loud. Every one has gone deaf. Death is around. Maybe she will listen. to play in a corner with my doll. Our neighbour boy Sonu came with a friend. He tore my doll into pieces. I was bleeding, I cried.